Not all brown or pink skin spots are melanomas, and they are rarely in the feet; but when they are, they are usually nasty! 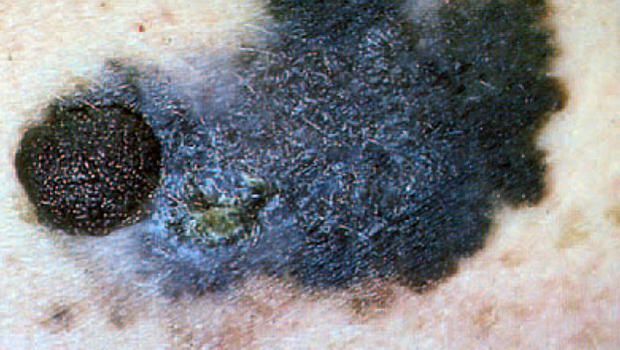 Melanoma is a cancer that begins in the cells of the skin that produce pigment or color. It is often called malignant melanoma because it spreads to other parts of the body as it grows beneath the surface of the skin. Unlike many other cancers, it can strike at any age. Melanoma that occurs in the foot often goes unnoticed during the earliest stage, when it would be more easily treated. By the time melanoma of the foot is diagnosed, it has frequently progressed to an advanced stage and is quite deadly. Early detection is the key to decreasing the death rate from melanoma. Who is at risk of melanoma? All of us, but certain factors can make you more at risk: fair skin, especially with freckles, blond or red hair, blistering sunburns before the age of 18, and numerous moles. What should I look for? 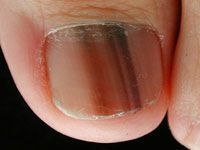 Melanoma usually looks like a brown or black spot on the skin or even under or near the toenails, but occasionally it can be red, pink or even white. D: Diameter - melanoma is usually getting bigger where a mole stays about the same. If you have any of these symptoms or a dark spot under your toenail that wasn’t caused by banging or dropping something on your toe, call or contact the office immediately! Wear shoes at the beach -- not just flip flops! Remember, if you think any spot on your foot or ankle has the "ABCD’s" of melanoma, call or contact the office immediately for a skin and nail inspection. Early detection is the key to successful treatment! Dr. Marybeth Crane ran the 2014 Boston Marathon as a tribute to the life of David Bloom, our physical therapy partner, who lost his battle with melanoma in December 2012. Dr. Crane also raised money for the Melanoma Foundation for melanoma education and awareness. She felt this tribute to his life and work will help the FAANT family celebrate his life, and feel like we have made a difference in fighting this terrible cancer that touches so many. Dr. Crane personally matched every single donation to double their effectiveness. Our goal was to raise $15,000 in the name of David Bloom.